Well it's been a pretty busy year for me. I started the year with a new job, leaving a lot of good friends and making a lot of new ones. The two don't balance each other out though and I still miss seeing some people around the office everyday. I did pop back for the XMas do of the last project that I worked on before I left, a project that I was on for around 8 months or so, and it was nice to see everyone again, albeit briefly. The new job is more me though, so I'm happy I made the move. Accent UK has done incredibly well this year. We've doubled last year's sales, I think down to the fact that we now have an on going series on the table at Conventions. 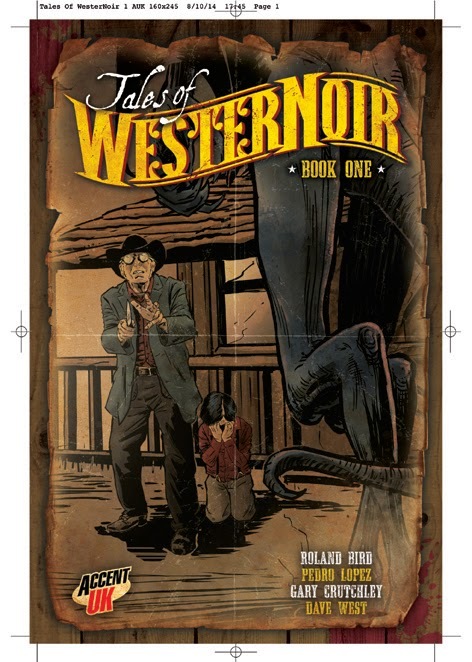 Added to WesterNoir it's also great to have Stephenson's Robot #1 out, it's been a while in development but it is amazing to see Brad Tuttle (INDIO! )'s art in all its glory. There'll be more coming next year with two issues of WesterNoir, another Tales Of WesterNoir and at least one Stephenson's Robot, as well as Strange Times Book 2, which wraps things up for Samuel Close and the guys. I've seen plenty of movies this year, Jemma has made sure we got to the cinema more than we have in previous years, and picking my favourite is even harder than usual. I really enjoyed Guardians of the Galaxy, I loved the Dawn of the Planet of the Apes, I was suitably shocked by Under the Skin and surprised that I actually enjoyed The Amazing Spider-Man 2 but I think my favourite has to be Captain America - The Winter Soldier. It just carried on the whole Marvel Universe so well and moved it to a very interesting place, whilst still being a film the worked as just a sequel to Captain America 1. It had it all and whilst Guardians of the Galaxy was novel and fun, this was just a great film that worked for me on a number of levels. I'm actually reading less these days, the train journey to work has been replaced by a car journey, where I'm the one driving. I did manage to read the last Skulduggery Pleasant book however and it ended things really well, pulling together all the threads and not ducking out of a few deaths and emotional moments, I'm looking forward to see what Mr. Landy does next. Apart from that I've enjoyed the Long Earth books by Stephen Baxter and Terry Pratchett, an interesting concept, good characters and nicely written. My favourite comic book of the year has to be Mind Mgmt by Matt Kindt. I only picked up the first two collected editions at Thought Bubble in November, as Mr Kindt was there to sign and sketch them, I'd heard that they were good, and Sumyra of Lucky Target Comics had recommended it to me. Wow, what a great story, crying out to be made into a TV series. I'd read Revolver by Matt, which I enjoyed, but I'm loving this series. Apart from that I've been following Lazarus and C.O.W.L, but interesting comics, and my only Marvel book has been Elektra, which I picked up for the artwork but am enjoying the tale being told. 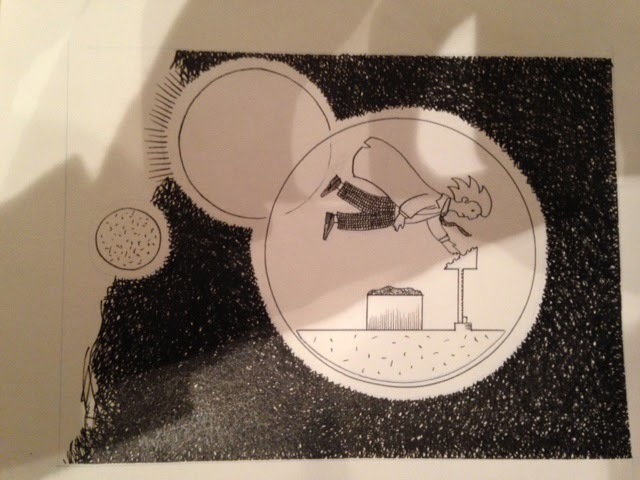 I hope to publish Has Kane Mesmer Lost His Magic Touch ?with Marleen Lowe's art. The Last Sketch Of The Year. Dan, who owns and manages my local comic shop, Millennium Comics in Northwich, gave me his convention sketchbook a few months ago and asked me to contribute an image, of my choosing, to the great collection he already has in there. For me this year has been quite momentous from a comics perspective, well for a number of perspectives I guess, and whilst Stephenson's Robot is now in print, for me my greatest effort has been on getting Strange Times 2 completed. 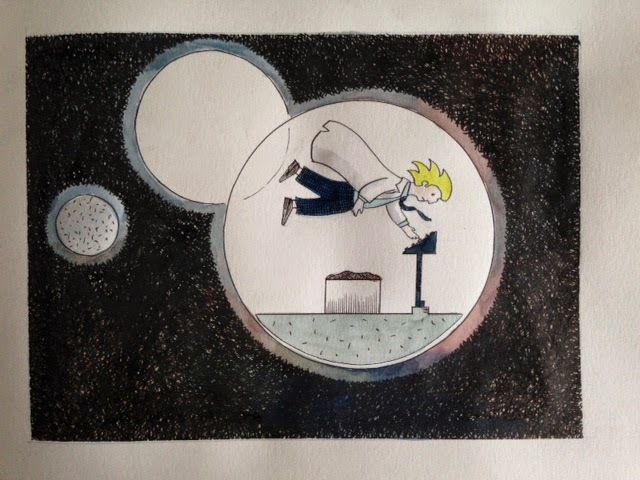 So, it didn't take me long to decide on doing Samuel Close in his Time, but sadly not Spatial, Travel device. The beauty of doing these sketches in your home, rather than being scrunched up behind a busy convention table, is that you can draw as you normally would, with no fear of getting nudged from the person on the table crammed in behind you, or of trying to balance everything on your knee. It also means that you can take more time over the drawing, and take on compositions that would not be possible at a Convention as it would mean that you would have to spend too long with your head down concentrating and less time talking to prospective customers and selling comics. For me, it also means that I can have a go at colouring, getting out a brush and water colour paints at a convention is not something that I have ever considered trying. So, all in all for someone like me, who is not that comfortable drawing at Conventions, this really lets me have a go at producing something that I'm pleased with, although that said I have been happy with some of my convention efforts. 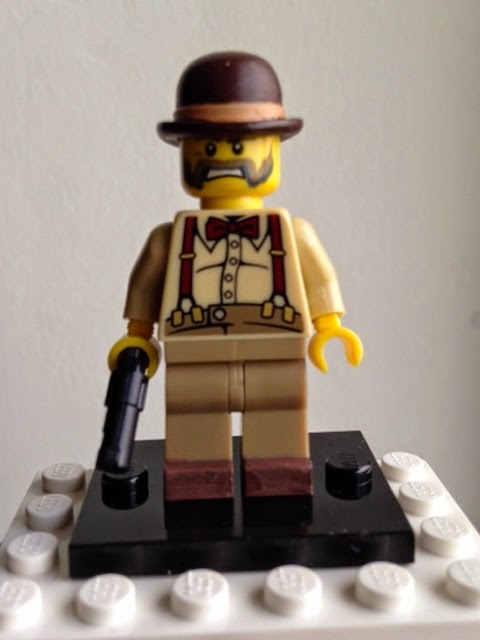 Tales Of WesterNoir - Baylocke in Lego. 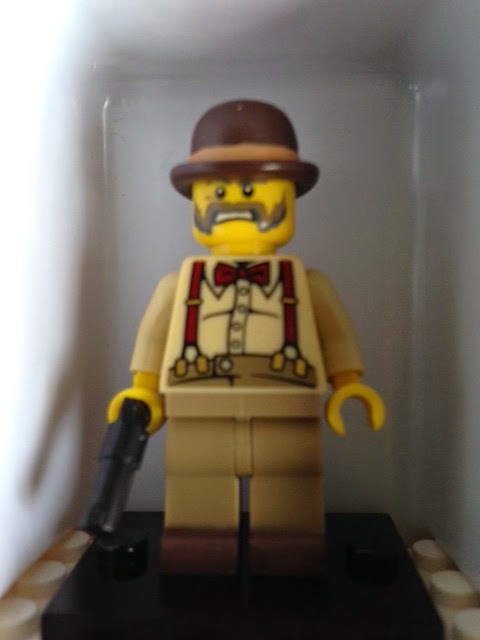 So it's the turn of Aloysius Baylocke to be immortalised in Lego. I love the way the figure came together... his face has the perfect expression. If you've not read any of the comics yet then you can find the links to a few reviews on this blog. As we approach 2015, Gary is finishing art on Issue 5 and we have a couple of artists working away on two short stories for Tales Of WesterNoir 2... and Issue 6 will complete next year's WesterNoir issues. We'll be trying to keep the same output going each year. The first Stephenson's Robot review. 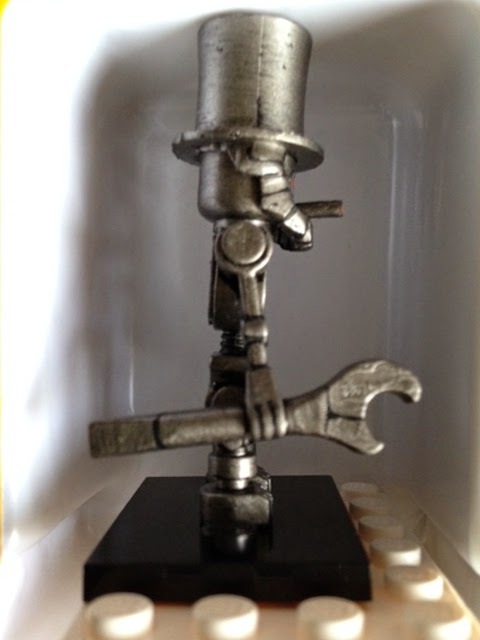 Issue 1 of our new book Stephenson's Robot has been reviewed over on travellingman.wordpress.com, and it's great to see that the first issue has hooked at least one person into our new little universe. A fair comment has been made about us not fully explaining the abilities of one of the characters... all I can say is that you'll learn more as the story continues... about his abilities and those of the strange characters that surround him. 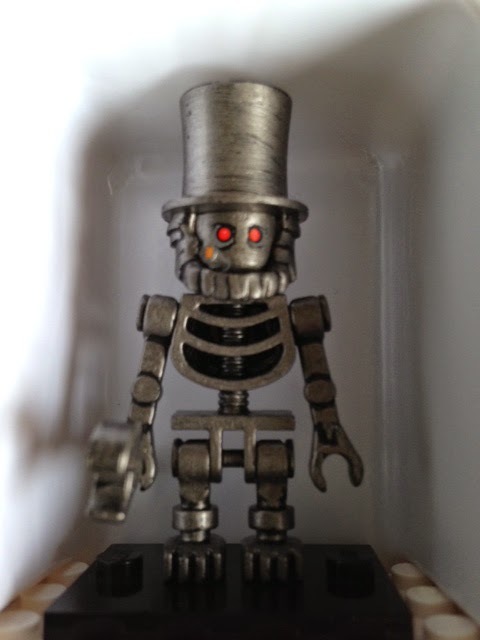 The design of Stephenson's Robot himself came straight out of Indio's mind ... as we collaborated on a tale in the Robots anthology a few year's back ... I was so stunned by Indio's art that I felt compelled to tell the robot's story and enjoy the pages of artwork as they hit my inbox. WesterNoir and Tales of WesterNoir reviews. A couple of popular website, Starburst and Travelling Man, have posted reviews of the WesterNoir books up on their websites. Both are great, with www.starburstmagazine.com reviewing all of them in one posting and travellingman.wordpress.com reviewing issue 4 of WesterNoir at Westernoir - Book 4 and then Tales of WesterNoir over at Tales of Westernoir - Issue 1. Both are very positive and it's always interesting reading where reviewers think the story is going and what it's about. I'll say no more than that, you'll find out more in Issue 5 which'll be launched at next year's DemonCon event in Maidstone. WesterNoir has been spotted by Weird West Jonny. We came across interest in WesterNoir from a posting over on a Facebook Group called Weird West Jonny from the 24th November. Stephenson's Robot On Sale In Millennium Comics, Northwich. I delivered 10 copies of Stephenson's Robot #1, and ten Tarot Cards for those wishing to purchase the Tarot pack, to Millennium Comics in Northwich yesterday. Dan wasn't around but Miles told me he'd read Dan's copy and that he loved it, which is always good to hear. We'll try and get some copies into Geekbox Comics over the coming weeks, but other than that it'll be available at Cons or through emailing me at accentuk@btinternet.com. 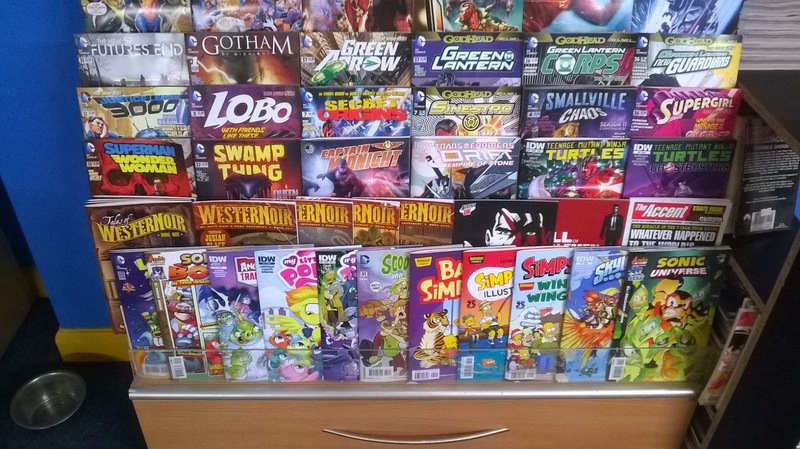 Accent UK titles on display at Geekbox comics in Newcastle-Under-Lyme. First Mini Review of Stephenson's Robot and Lego Kingdom. 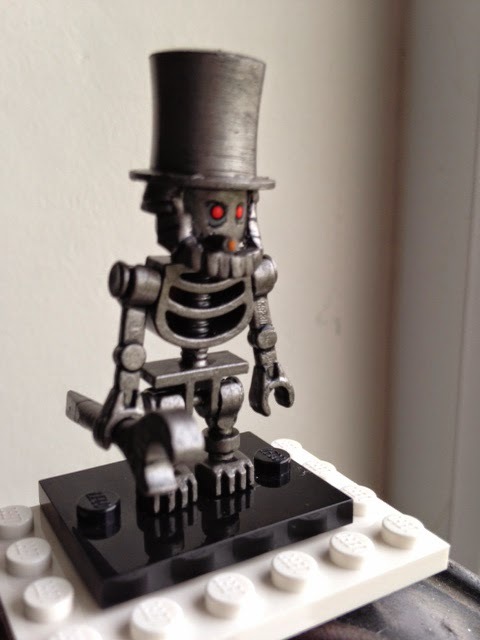 And, keeping with tradition, here's Stephenson's Robot, Kingdom himself, in Lego. ''I just read 'Stephenson's Robot' #1 from AccentUK, it's the first of seven issues and I can't wait to read more! 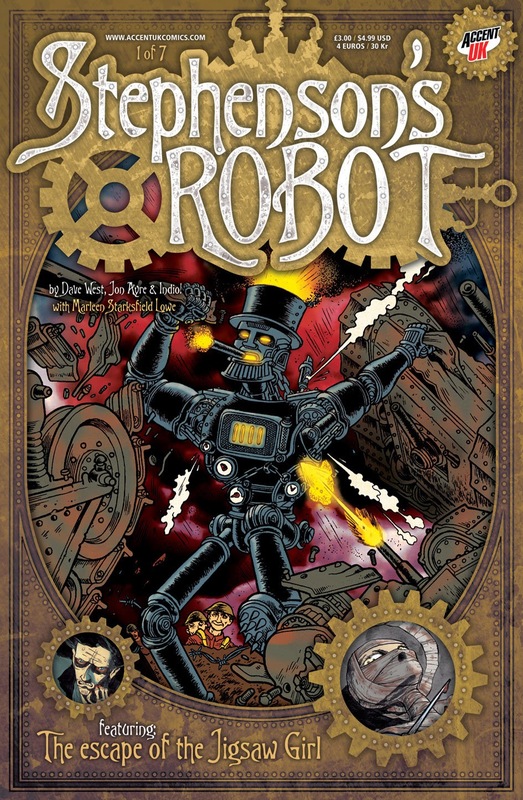 😀 Written by Dave West and Jon Ayre the story introduces a colourful cast of characters, including asylum escapee Jimmy the wolf boy, the carnival master Mr Cruikshanks (with psychic powers and a sinister plan), the Jigsaw Girl (a nice spin on Ray Bradburys The Illustrated Man) and Kingdom - the steampunkish robot himself. The last Convention of the year. You may have got a sense of it from reading Convention reports on this blog, 2014 has been the best year yet for Accent UK. We've made record sales at Conventions and our on going series WesterNoir has really begun to gather more and more readers with each Con we do, as well as bring existing readers to the table to pick up the latest instalment. 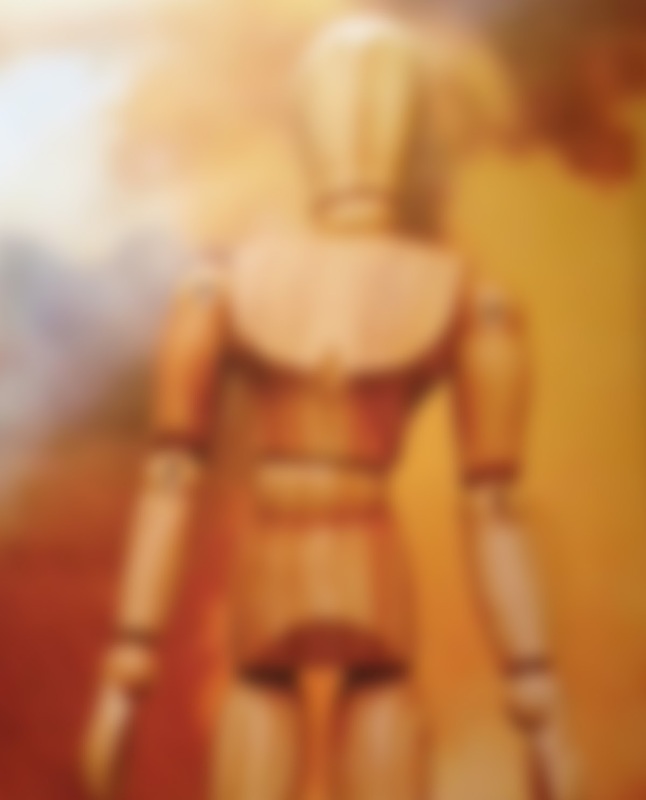 Before WesterNoir however Stephenson's Robot was going to be our first on going series, well a 7 issue mini-series, and it's a very ambitious project for us which meant it has taken longer to get to print. But it did. And Thought Bubble saw it on the Accent UK table in all its splendour. It's a very different book to WesterNoir and there's always the slight concern that readers of one wouldn't naturally be interested in the other. 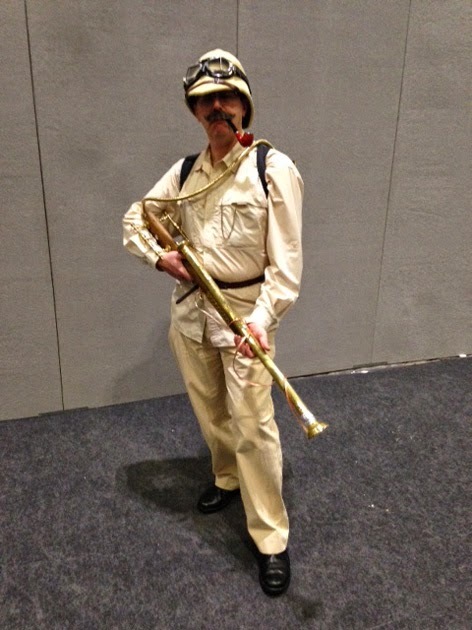 So, with two new books and one of them, Tales Of WesterNoir, extending an existing series, we felt well placed to do well at this Convention too. Driving over and setting up the morning of the first day of the Con is nothing new to us and we made it in plenty of time for 'doors opening'. We were joined once again by WesterNoir co-creator Gary Crutchley (and you can read his report over on his blog) and Scott (Colin's son), so we had enough cover to allow us all to take time out from behind the table and wander around. It was great to bump into Bridgeen Gillespie again after so many years and I of course picked up her great little collection of short stories, Flash Fiction. This year we had Andy Bloor on his own table sat next to us, selling his own self published book Midnight Man. It's a very different book to Wolfmen, being written by Mo Ali and is a frantic fast pace actioner from beginning to end. It looks great with Andy's moody style jumping at you from every panel. 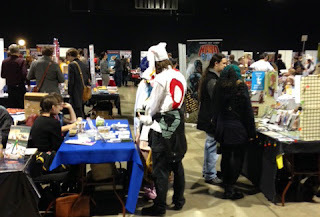 The organisers of Thought Bubble had changed things once again, this time adding a large Marquee to the square sat between the Main Dock hall and the Armouries. And it worked really well. This then was where most of the professional guests were sat and this is where the fan boys queued for signings and sketches. I was one of them for a while and spent a nice half hour chatting with Brian Hurtt as he drew a great sketch in my collected The Sixth Gun. We handed him a copy of the WesterNoirs as a thank you. A typical slow start soon turned into a busy day, with repeat customers, Facebook friends, new customers and interested folk coming in waves. WesterNoir being very well established now got the most interest but Stephenson's Robot had more than its fair share of sales as people were drawn to INDIO's wonderfully crazy artwork. It really is a gem of a comic. So, by the end of the day we realised this was our best Thought Bubble ever, and that we'd already sold more books than we had over both days last year. A nice evening spent talking comics over a burger and beer, and it was the perfect end to a great day. Sunday started slower than Saturday. it always does, but unlike previous years, rather than sell half as many books over the day we actually sold nearly as many as we had on Saturday. This was turning into one of our best ever Cons. All books sold well but newer books sold better than the others, which is to be expected. The Tarot Card edition of Stephenson's Robot went down well, as hoped, and we'll certainly continue producing a new card with each issue. 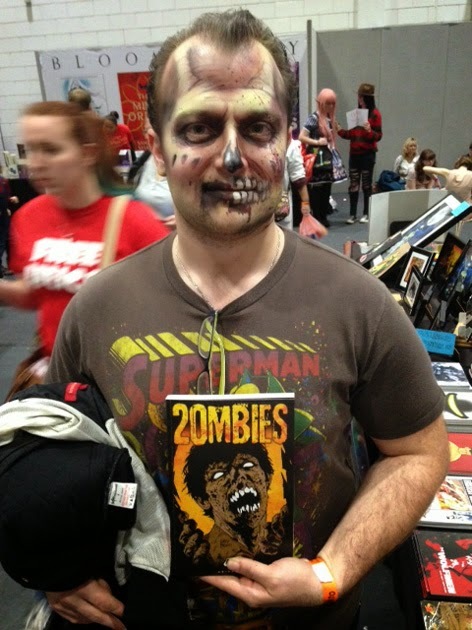 Andy Bloor, next to us, also had a good con with plenty of sales. So, all in all it was a great two days and certainly just what we needed to keep us energised over XMas to continue working on the next issues of WesterNoir, Tales Of WesterNoir and Stephenson's Robot, as well as a number of other projects. and it'll be signed by Gary and myself. 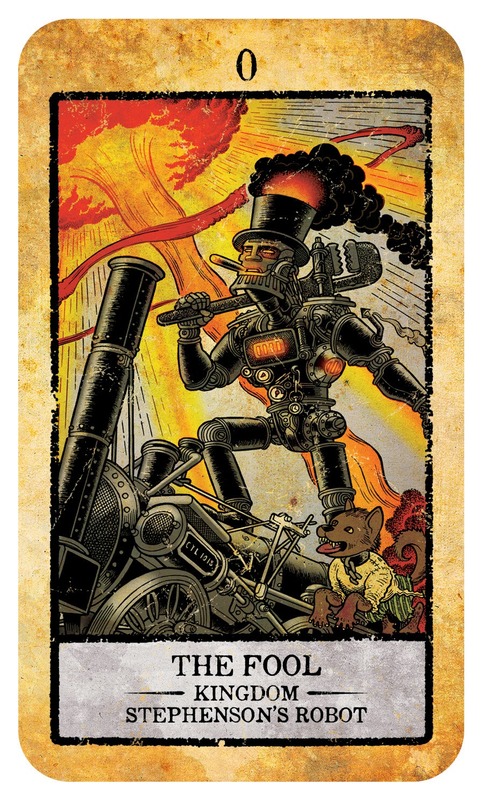 Also, the first Stephenson's Robot Tarot Card will be available in a limit Tarot Card pack, for the princely sum of £5, which equates to £3 for the comic and £2 for the card... art by INDIO!, colours by Jon Ayre and card design by Andy Bloor. And... we're in the news ... comic books news that is of course. Stephenson's Robot gets a mention over at DownTheTubes as does Tales Of WesterNoir at DownTheTubes. 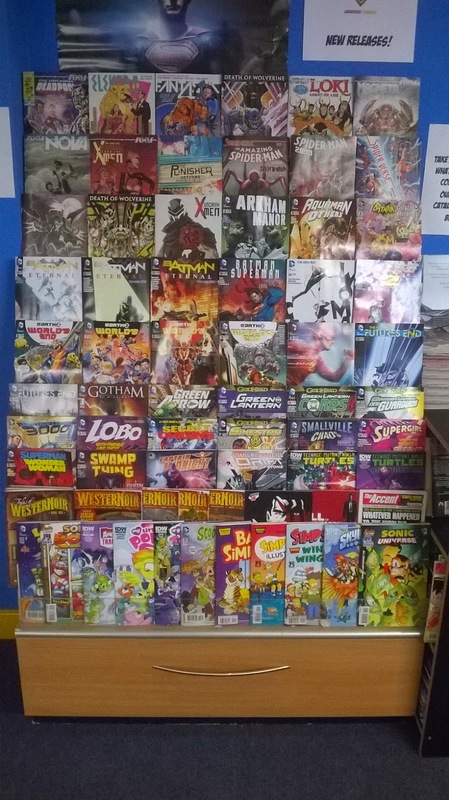 You can also see what we're up to over on the Accent UK Comics group on Facebook. 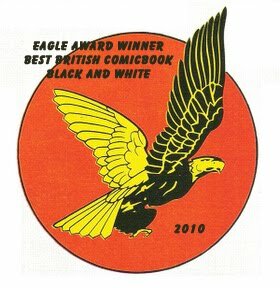 Comic books launched at Thought Bubble next weekend. 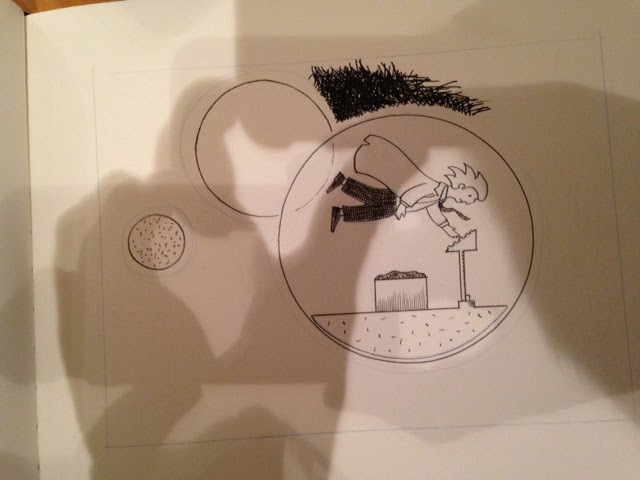 I'm creatively involved in two books to be launched at next weekend's Thought Bubble in Leeds. Stephenson's Robot has been in development for a while now, but it's quite an undertaking and we've taken our time a bit to make sure we're all happy that it's the best it can be. With amazing art from INDIO!, this builds upon the characters introduced very briefly in a tale in the ROBOTS anthology we produced a few years ago. With a fabulous cover, designed by Andy Bloor, and a back up story illustrated by Marleen Lowe (whose work you'll have seen Whatever Happened To The World's Fastest Man ?) this seven issue mini-series will see events unfold in an alternate reality First World War. Written by myself and Jon Ayre with all character designs by INDIO!. I've been looking forward to seeing this book on our table for a long time now. And it's a full colour comic, I can't wait for next weekend. 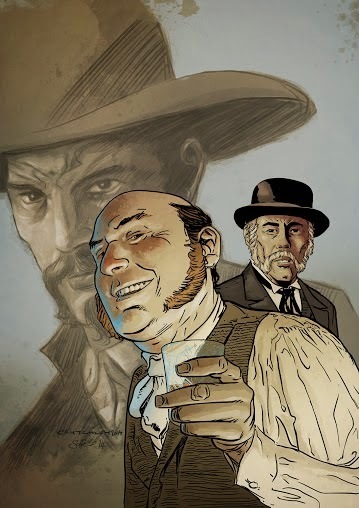 The other new release is a companion comic to our WesterNoir mini-series, which will be continued early next year with Issue 1 of the second mini-series. Tales Of WesterNoir then allows us to tell the stories that surround events in WesterNoir, featuring main characters and minor characters alike. The first issue has tales from Gary Crutchley and myself illustrated by Roland Bird and Pedro Lopez respectively. Again wrapped in a cover designed by Andy Bloor, illustrated by Gary Crutchley and coloured by Matt Soffe. 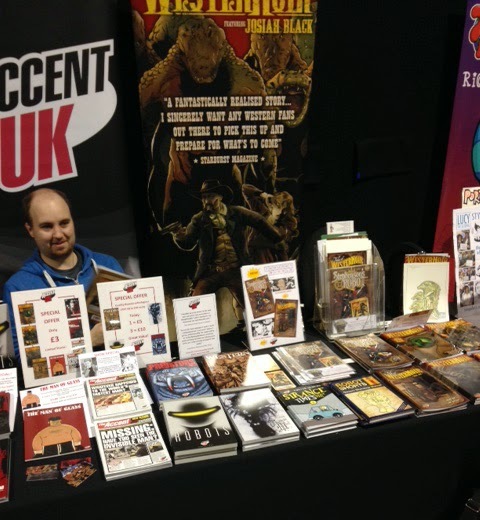 And if you're a fan of our Wolfmen books then be sure to check our Andy Bloor's self published Midnight Man... he's got the table next to us. 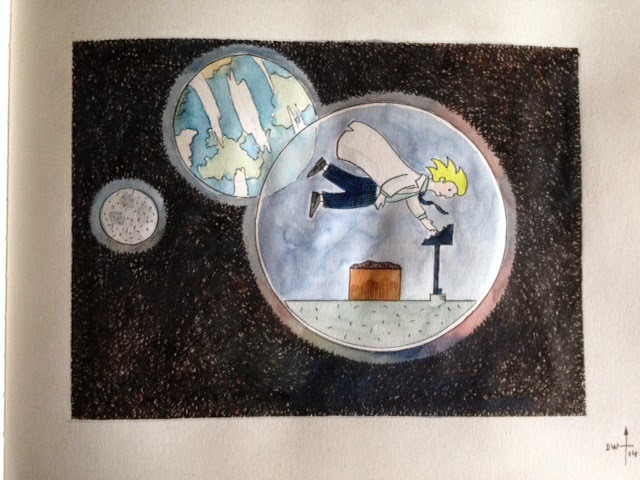 Artwork for the cover of Issue 5. 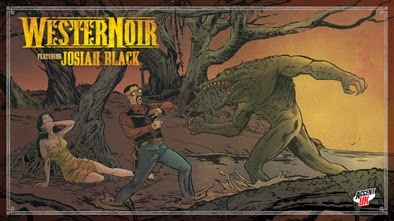 Travelling Man has reviewed the first three issues of WesterNoir over at travellingman.wordpress.com. I'll drink to that. London MCM, two great days. 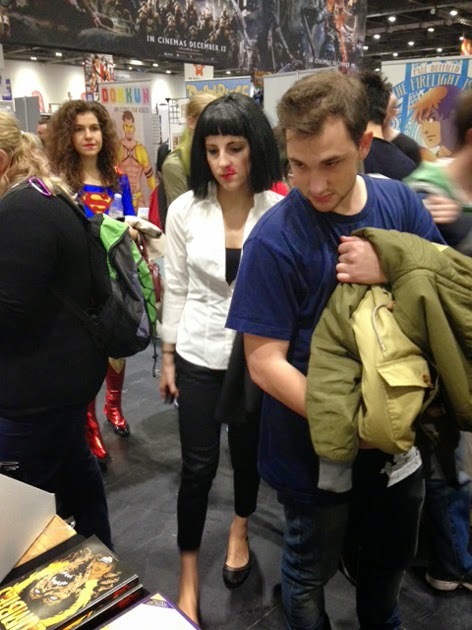 This then was our second London MCM in the same year. We had no new comics since then last one, and despite Colin's infectious optimism I had my doubts. We did so well at the last one that I really doubted we could get near selling that number of comics again. Still, getting half way towards it would still make it a good Con from our perspective so I was more than happy to make that very early trip, with Jemma, to catch the 6.30am train out of Crewe. Colin and Scott had travelled down the day before and had already had half a day at the Con on Friday, so I really shouldn't grumble. You can get a really good report of how the event went over on Colin's blog, so I'll use that fact to keep mine briefer than normal. I will say that for two days I stood looking up at the biggest movie poster I've ever seen and by the end of the Con I was desperate to go and watch the final film in the Hobbit trilogy. I will also say that once again I was stunned by the costumes wandering around and felt at times that I'd wandered into a space port in a far flung part of the galaxy. ...and if you don't know who she is then you're a very lucky person as it'll mean you have yet to enjoy Pulp Fiction for the first time. We had periods where we were really busy, at one point I was serving three customers (I can't remember where Colin and the others had gone) and other periods when it was really quiet and we could sit and chat. ...although they only seem to be interested in one title. A very tiring but very enjoyable two days. We hadn't sold as much as last time, but we did pretty well and weren't too far off. We managed to spend some time with old friends and made some new ones (Colin has listed most people on his blog), but I'll just say that it was great to see Steve Tanner again, Stuart Gould our printer and Jenika Ioffreda with her collected Vampire Free Style, a lovely little book. Looks like we'll be doing two London MCMs every year from now on then. With all the recent activity at 50th birthday weekend celebrations, Comic Conventions overseas and the Kate Bush event, it was really nice to spend a relaxing weekend with my wife. We decided on the other side of Britain and booked a hotel room in Whitby, or Dracula fame. We got very lucky with the weather, which is still unseasonably sunny and warm. Well, it is warmer than the seasons we've grown up with but maybe it'll be the norm for the next few generations. Whitby is a great little seaside village, with a good history of fishing, a lovely beach and some really nice walks. The beach is a sharp decent from the hotel we were staying at, but this did mean that we had a great sea view from the hotel window. As usual my photos focus mainly on objects that are rusting, I'm not really sure what is is about decaying metal that draws me to it, I think it's the colours and textures, but drawn I am. And what with all that salt in the air, the seaside always provides lots of source material. Jane and I spent Saturday wandering along the beach, popping into a Vintage Fair that happened to be on, and wandering around Antique and Curiosity shops. Tea was a great Fish and Chips meal for me. I always get some Fish and Chips in when I visit the coast as it's always the best in Britain, with the fish being so fresh. But I didn't brave the sea. I think this is probably the first year in a long time that I haven't taken a dip in the waters around the UK. I jut never managed to get to a beach during the summer, and as warm as the sun was last weekend, it was not having the slightest effect on the temperature of the sea. Well, it felt freezing to me anyway. On the Sunday we took a trip to Robin Hood's Bay, which is glorious but a challenge to get to as it's a steep walk down to and a steep walk back up from. It's well worth the climb though. A beautiful little village with some lovely little restaurants facing out over the coast. Wonderful. Stopping off at Filey before heading home completed the weekend. Very relaxing and lovely to get away from it all and just wander around and relax. It's a different pace of life on the sea front. All that energy of the sea never seems to make it beyond the waves breaking on the shore line. The towns and the people in them move at their own pace, a much slower and more relaxing one. You don't feel like rushing around. You just feel like becoming part of it all. It was a shame to have to leave it. But it'll be a pleasure to go back to. To recharge batteries and be able to remember that it is possible to just slow down. Even if it is only for a short time. Gary and I decided that we wanted to tell more tales set in and around the events that take place with WesterNoir, but didn't want to take Gary away from his main focus, busy as he is on issue 5 of Westernoir. So the idea was born that we'd create a comic to accompany it, but this time we'd both write separate stories and get some of our favourite independent comic artists to illustrate them. And so Tales of WesterNoir was born, and the first issue is now complete, with Andy Bloor once again bringing his design talent to the book to help it stand out from the crowd. The book will be launched at Thought Bubble on November, with Issue 5 of WesterNoir launching at the first con of 2015. You can see the cover's evolution over on Gary's blog. 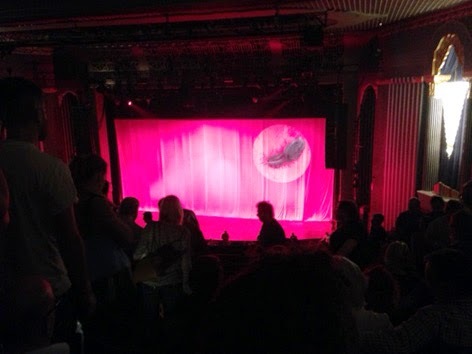 An evening with Kate Bush - part two. My last post has received some feedback, as you'll see from the comments. And I guess the people who posted the comments are right. And yes, I do hope that you all get to sample the crazy genius that is Kate Bush in your living rooms in the not too distant future. I'd say that I'm quite a visual person, but I also love music. I love strong lyrics but also a good tune. For me a good film has a good balance of story, cinematography and soundtrack. A good concert has a good balance of songs, performance and interaction with the audience. From the moment that Kate Bush lead a line of musicians onto the stage I was captured. Even that simple procession spoke to me that this was all going to be choreographed. The first few tracks (I forget the number ... was it 5 or 6 ?) that followed were typical concert fodder however and I forgot about anything but Kate, her voice and her presence, Kate standing out there on her own, band behind her and a sea of welcoming fans in front. Her voice is still great. And then the whole thing turned on its head as a video was projected onto the back screen. Was this then to turn into a mixture of music videos, interspersed with Kate singing live ? No. The whole thing turned into a... well I don't know what to call it really, a story in song ? Theatre centred around a drowning woman, reflecting on the loss and the impact it'll have on loved ones, with The Ninth Wave from her Hounds of Love album carrying us along. I'm a visual person and my eyes were drawn to the skeletal fish characters that trawled the stage, looking for lost souls maybe ? The huge sheets of material being moved on the stage floor contributing to a feeling of being adrift, at sea with the drowning woman, and the little scene where she almost 'ghosts' her presence in her family home is... well.. it was all quite consuming. And then, to a standing ovation Kate announces that there would be a short break. I remember thinking... 'Wow, there's more'. I remember exchanging a few words with Colin sat next to me as we both tried to come to terms with what we'd just experienced. What I should have been doing was clearing my mind for what was to come. The second 'Act' was inspired by the music from the more recent Aerial album. The fish were replaced by birds, but mostly projected this time, although a raven's wing does feature. There's also a life sized (well the size of a young boy) artist's manikin who enters through the biggest pair of doors I ever seen (on stage or elsewhere) and I was completely absorbed once again. The Sky of Honey picks us up and carries us aloft. There was just so much to take in. I was fooled at one point, I'll say no more on that as hopefully you all will be too when you watch then video... almost a slight of hand trick .... a magicians misdirection .. and Kate is certainly that, a magician conjuring with words, music and theatre. I felt exhausted... so I can only imagine how she felt. Kate did come on to do an encore, and we were all singing along to Cloudbusting, but by then my mind was full. I was trying to make sense of some of the things I'd seen and was marvelling over others. So...was this a good concert ? It felt like I've been to a couple of musical theatrical performances, with some songs at the beginning to introduce you to the performer (not that Kate needed any of course) and a couple at the end to help you get yourself into a state where you could be trusted to be able to walk down stairs and cross busy streets with some awareness of your surroundings. Even so, people milled around outside the venue, almost reluctant to go home. Wanting to keep hold of the experience for just a little longer.